Wilhelm Schmitt & Co have been making tools in the steel town of Remscheid since 1858, so I was not surprised to open my parcel from GreatArt and find four well-turned out tools that immediately felt comfortable, at least in my hands. The range to be tested consisted of a 9mm No.7 gouge, a 6mm, 45 degree V-tool (No.41), a 18mm bevel-edged cabinetmaker's chisel, and what I would call a narrow-bladed trimming knife. The tools I was sent were all well-formed and set straight and firm in their handles. The three 'long tools' were set in faceted, hornbeam handles which I found convenient when put down and comfortable in the palm. The knife handle seemed to be beechwood, the standard shape for German and Swiss 'bench knives'. Back to the big tools. At first sight, the junction of blade and handle looked clumsy. The tang goes in as far as a broader than usual flange. A large, cup-shaped ferrule is added to prevent the tang splitting the handle. Whether or not you find the arrangement aesthetically pleasing, it certainly feels solid and I have no doubt it does its job. The bevel chisel was fitted with a top ferrule ring too, a nice touch if much mallet work is likely. Turning to the carving gouges, I was puzzled by the large difference in blade length, the V-tool measuring 120mm whilst the No.7 gouge was only 90mm long. I was told that Kirschen make their gouges in two ranges, standard and short. 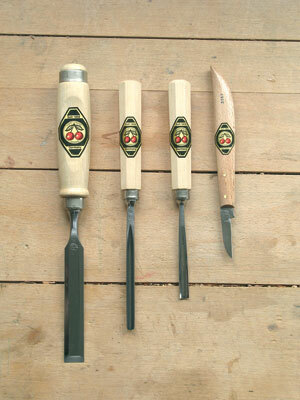 The four piece 'beginner's set' contains one knife, one short gouge and V-tool, and straight tools of standard length. The short blade worked well with a mallet, but I found it inconveniently short when carving 'two hands on'. However, the short tool seemed identical in quality to its bigger brethren. In all cases the business ends were well shaped, ground to a suitable angle for general use - I measured 23 degrees on the chisel - and sharp enough to cut. But not sharp enough for a woodcarver - they needed honing. Once honed they cut very well. I found them well-balanced and 'delicate' to use. 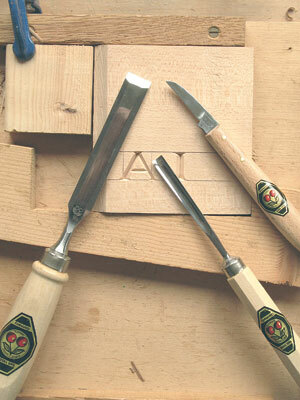 I felt they were all, even the chisel, best suited to refined use. Another thing I enjoyed was the way the top edges of the gouge and V-tool were rounded over. Half-an-hour slicing through lime and then oak satisfied me that the steel held its edge at least as well as my better gouges (mostly Pfeil and Iles). The only carving task I could think of for the bevel chisel was some lettering. Personally, I prefer a carpentry bevel to a carvers' No.1 for the straight cuts. It proved ideal and I completed a few (non-curved) letters with just this; the knife and the gouge to turn the serifs. Having had no preconceived ideas about the Kirschen brand, a couple of hours' use convinced me that if my small sample is representative, they are first-class tools. Bearing in mind the caveat about the length of the shorter range, I would recommend them, provided the price is competitive with other high quality gouges. "I would recommend them, provided the price is competitive with other high quality gouges"